2015 Virginia General Assembly legislative updates, including a few significant firearms bill vetoes. The bills that passed will become law as of 7/1/15. This Power Point is from a presentation by Susheela Varky to Virginia legal aid attorneys on June 3, 2015. The goal of this 2015 online survey was to determine access to and use of sexual health care services among adolescents and young adults with and without a history of sexual coercion, and to examine whether a history of sexual coercion was a barrier to using sexual health care services. The study ultimately found that having a history of sexual coercion was not a barrier to the use of health care services among adolescents and young adults. In fact, rates of health care service use were higher among those with a history of sexual coercion than those without such a history. This handout was provided by Santa Sorenson, from the Richmond Peace Education Center, at the workshop titled "Conflict Resolution" at the Virginia Department of Social Services Office of Family Violence Promising Practices conference on September 16, 2013. 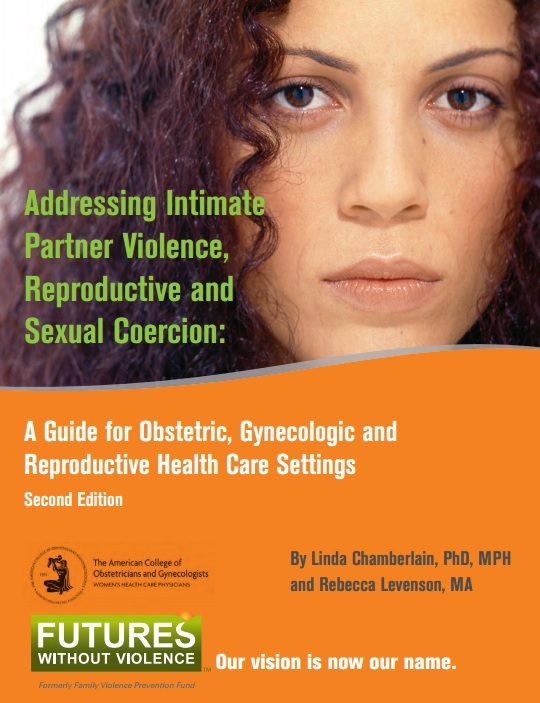 Futures Without Violence, focuses on the crucial role of the health care provider in identifying and addressing IPV and reproductive coercion. This Power Point presentation was presented by Qullin Drew Musgrave and Liz Cascone from the Action Alliance at the Virginia Department of Social Services Office of Family Violence Promising Practices conference on September 16, 2013.